If we learn we have collected or received personal information from a child under 13 without verification of parental consent, we will delete that information. If you believe we might have any information from or about a child under 13, please contact us at peaksportshelp@gmail.com. Surveys: We may from time to time provide a link to a third-party survey company for our users to fill out. Surveys provide us with information on sports psychology to help us better understand our users’ service needs. We encourage you to submit this information so we can provide you a more personalized experience on our web site but participation is entirely voluntary. We use a service provider to serve our users surveys. This service provider is not authorized to use your information for any other purposes. Choices about Cookies: You can configure your browser to accept all cookies, reject all cookies, or notify you when a cookie is set. (Each browser is different, so check the “Help” menu of your browser to learn how to change your cookie preferences). Our Practices Regarding Cookies: We administer cookies on our site to provide you customized content, keep track of preferences you specify while using the site, estimate and report our audience and traffic and conduct research to improve our services to you. None of the information in these cookies is tied to your personally identifiable information. 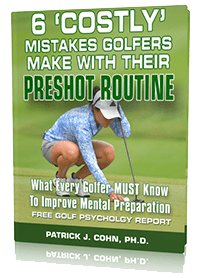 We offer outside links in the www.sportspsychologygolf.com website, which link to other websites. These outside sites are not under the control of Peak Performance Sports. We are not responsible for the contents of any linked site. We will send you strictly service-related announcements on rare occasions when it is necessary to do so. For instance, you will receive confirmation of any orders, response to any email inquiries and if our service is temporarily suspended for maintenance, we will send you an email. Generally, you may not opt-out of these communications, which are not promotional in nature. This may include order confirmations, emails containing tracking number details. If you use a bulletin board, blog, or chat room on this website, you should be aware that any personally identifiable information you submit there can be read, collected, or used by other users of these forums, and could be used to send you unsolicited messages. We are not responsible for the personally identifiable information that you choose to submit in these forums. To request removal of your personally identifiable information from our blog or community forum, contact us at privacy@peaksports.com. In some cases, we may not be able to remove your personally identifiable information, in which case we will let you know if we are unable to do so and why. Peak Performance Sports, LLC fulfills and ships all orders for delivery processed on our site. We also employ the services of a service provider to process payment on our website for purchases you make on our site. The cart is co-branded as a Peak Performance Sports, LLC page while payment is collected and processed by a service provider when the “Credit Card” option is selected for payment. When you select the “PayPal” option, your payment information is processed by PayPal on behalf of Peak Performance Sports. None of these service providers are authorized to use your information for any promotional purposes or any other functions beyond the ones described above. To access, delete or update your information on our site such as your email address, please contact us via email with your request at: – privacy@peaksports.com . We use local shared objects, also known as Flash cookies, to store your preferences such as volume control or high game score, or display content based upon what you view on our site to personalize your visit. Third Parties, with whom we partner to provide certain features on our site or to display advertising based upon your Web browsing activity, use Flash cookies to collect and store information. Our Site has security measures in place to help protect against the loss, misuse, and alteration of the personally identifiable information and Data under our control. Peak Performance Sports, LLC employs industry-standard technology to help prevent interference or access from outside intruders. Our payment processors employ SSL [Secure Socket Layer] encryption to ensure that users’ sensitive information is protected and encrypted when processing credit card transactions on our site during the payment process. We will retain your information for as long as your account is active or as needed to provide you services. If you wish to cancel your account or request that we no longer use your information to provide you services contact us at privacy@peaksports.com. We will retain and use your information as necessary to comply with our legal obligations, resolve disputes, and enforce our agreements. Reviews: Should you decide to write a review, we request certain personally identifiable information such as your first name, last name, city and country of residence, and your email address (which we do not publish) to complete your review. Please be aware that any personally identifiable information you submit within a review can be read, collected, or used by other users. We are not responsible for any personally identifiable information that you may choose to submit in these forums. Testimonials: When you submit a Testimonial to Peak Performance Sports, LLC, we collect and publish your information, which may include your first and last name, sport, and or current location. We obtain your permission prior to posting your testimonial on our site. If you wish to update or delete your testimonial, you can contact us at privacy@peaksports.com. If you are outside the European Union and opt to receive any free resources, participate in any free training programs, register for a webinar, register for a live event, register for a seminar, or purchase any products sold by the Company on this Website, we will automatically enroll you to receive our free email newsletter. If you do not wish to receive this newsletter, you can unsubscribe anytime. We include an “unsubscribe” link at the bottom of every email we send. If you ever have trouble unsubscribing, you can send an email to peaksportshelp@gmail.com requesting to unsubscribe from future emails. If you are in the European Union and opt to receive any free resources, participate in any free training programs, register for a webinar, register for a live event, register for a seminar, or purchase any products sold by the Company on this Website, we will only enroll you to receive our free email newsletter if you affirmatively consent to it. If you do not wish to receive this newsletter, you can unsubscribe anytime. We include an “unsubscribe” link at the bottom of every email we send. If you ever have trouble unsubscribing, you can send an email to peaksportshelp@gmail.com requesting to unsubscribe from future emails.